We’d like to introduce, the event planner and creative mama behind Sarah Sophia Productions. 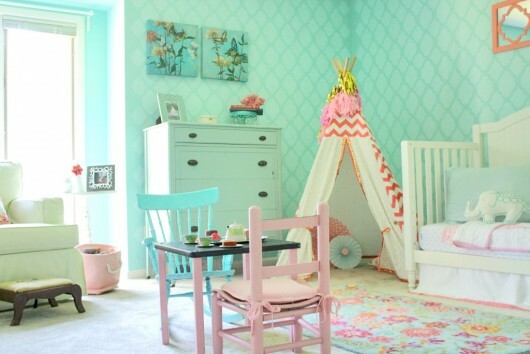 Sarah admits, “I have a love affair with coral and blue!” So it was no surprise that she painted her favorite colors in her daughter’s nursery. That was two years ago and now the adorable newborn has become a lovable toddler in need of a big girl’s bedroom. Sarah loved her stenciled walls. She had painted it while she was pregnant and the painted pattern brought back happy memories. To create the gorgeous accent wall, Sarah painted Sherwin Williams Aqueduct and then stenciled the Rabat Allover pattern in Sherwin Aquantint. Sarah decided to keep the stenciled wall and make decor updates to freshen up the space. 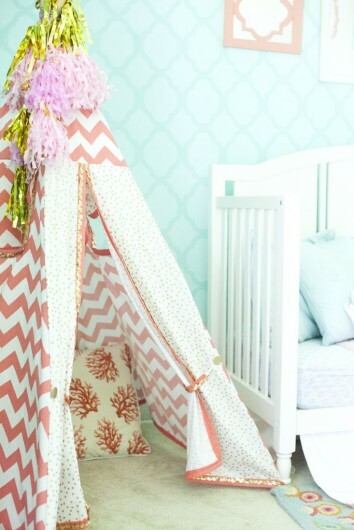 Sarah’s daughter, Charlotte, loves to read so one of the decor updates included this adorable coral teepee which functions as a reading nook. She also transitioned her daughter from a crib to a toddler bed. The coral and white wall art compliment the stenciled wall. So tell us, what do you think of this stenciled little girl’s bedroom? Leave us your thoughts in the comments below! Find your favorite wall pattern from Cutting Edge Stencils!